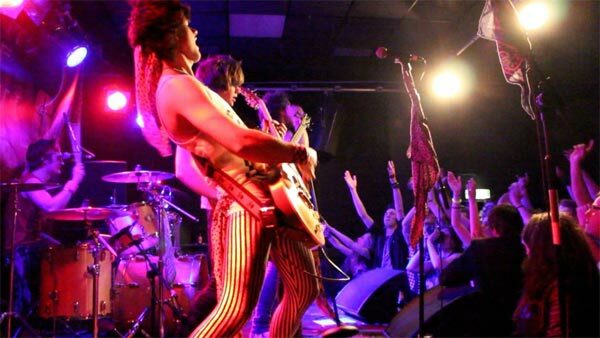 We interrupt this ongoing track-by-track review of XRP radio album to bring you news of an incredibly good young hair metal band from Southampton. My friend was walking past the Chill Bar last night, around 7.30 in the evening and he heard the band soundchecking. He thought they sounded pretty good and sent me a text, as he knows I like a nice tune. I’m just walking past Chill Bar … Saints Of Sin, sound OK, for a person that’s not into that kind of music. Guns N’ Roses style. I have translated his text speak into English. Well the TV on a Saturday is specifically aimed at driving music lovers out of the house and good for them. It could have been X-Factor or BGT, but at this time of year it is the BBC’s “The Voice” (not to be confused with the vastly superior “The Voice FM” in North Devon) So after me calling Tom Jones a moron for the fourth time my wife was practically begging me to go to the pub. I like it when a plan comes together. So off I toddled the hundred and fifty yards to the Chill Bar from my house and ordered a diet coke, because I am a great big fat git who has decided to lose weight live on the radio. Promo image taken from the band’s Facebook page. So anyway, I got there around half nine, and the band were generally milling about in the corner of the room, chatting and applying hairspray to their enormous haystacks of hair. I did vaguely wonder if this was going to be worth bothering with but my friend John Forster who does “Dr. John’s Unsigned Rock show” told me they were good and I could hardly sneak off when folks had seen me come in. In shiny spandex, with slashes in the legs, and leopard-skin prints they looked every bit the hair metal band but could they play? It was just after ten when they finally got on stage. There was a recorded intro, very theatrical, and they lined up with their backs to the audience facing the drummer as they built the excitement. It could all have been so embarrassing if they were not such fantastic musicians. Onstage at one of the larger venues that they should be playing in every night. It was well worth the wait. From the moment they started, to the end of the night (midnight) they never once let up, putting on a show as if they were on a big stage and playing to thousands of people. There were barely twenty people in the place at the start. More drifted in as they do there, but it is inevitable that the turnout would be poor for a new originals band in town. The band were immensely energetic; jumping in unison, high kicks, moving around the cramped environment of the Chill Bar with synchronicity and style. All the front guys were wireless and frequently left the stage area to mingle with the slowly growing audience. Unfortunately i’m not taken in by gimmicks Olli, did they back it up without being cheese? Well yes they most certainly did. And of yes, when they say “Lead drums” and Lead bass” they are not kidding. Original song “Animal” (not the Def Leppard song) followed by one you’ll know. 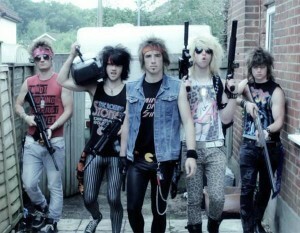 This is not the kind of band that is “all about the guitarist” or any other individual band member. it is an awe inspiring team of seriously together musicians who have honed their skills to the highest degree. It is most certainly not style over substance but a realisation that if the music is to be given the best chance of succeeding then there must also be a show. The songwriting is highly accomplished as well (I am going to have to consult a thesaurus soon to find alternatives to superb, brilliant, excellent, etc) Any one of their songs could, and indeed did, sit quite happily alongside the likes of Bon Jovi, Guns N’ Roses, AC/DC, etc. 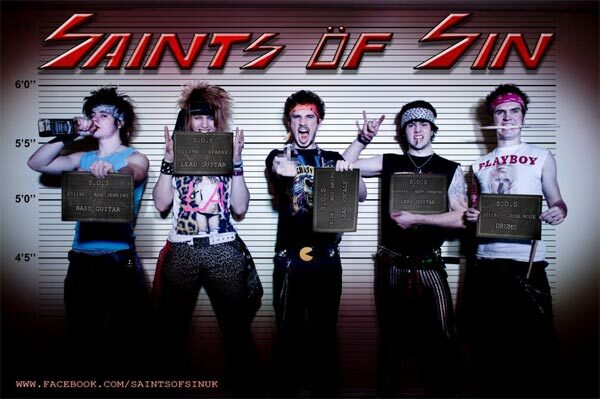 Saints Of Sin played a smattering of covers in among their own material. All of them were well known tracks that you could sing along to, “I Believe In A Thing Called Love” “Livin’ On A Prayer” “You Shook Me All Night Long” “Sweet Child Of Mine” etc but this audience could be seen and heard singing along to the band’s own material, and in the end, up and dancing to it as well. Now bear in mind that this was the band’s first visit to Ilfracombe and you get an idea of how engaging the songs and the band are. There is no downside, unless you are just not interested in rock music. They have the image, the presence, the talent, and the songs. On top of that, they have their PR and management (Rosebud) organised properly. The Facebook page has getting on for a thousand likes already, great images, and plenty of information. There is a link to that all important thing, a proper official website which looks really well put together. Simple effective and punchy with navigation to the most important bits, the bio and gig list, prominent. From there you also find links to Twitter and, alright I have finally found something to criticise. The Twitter header image is aligned so that the twitter icon image is right over singer Rui’s face. Ha ha ha that’s how hard it is to find anything about this band that is not already perfect. Oh yes, they have a Youtube profile as well as you can obviously tell from the fact that I shared a video of theirs. And there is Reverbnation, although I haven’t found a Bandcamp page for them. I like Bandcamp. I know I’ve said it before, but I don’t think anybody lets you keep as much of your money from music sales as they do. Feel free to correct me if I am wrong.